Hello and Happy 2nd Thursday of the month a.k.a. 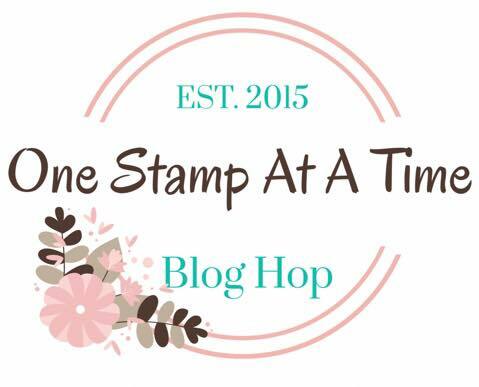 OSAT Blog Hop Day! What a fabulous line up we have for you this year! You are going to LOVE all of the inspiration heading your way! If you've already been hopping, you should have landed here from the amazing blog of Sara Levin and I would like to thank you for continuing on! Our theme of course is "Sale A Brate The Occasions" and is all about the Stampin' Up! Occasions and Sale-A-Bration Catalogs. They are both chocked full of fabulousness! There are so many awesome options to focus on but I decided to go with the SAB Beautiful Peacock Stamp Set. Sometimes it's nice to have a simple yet fun stamp set that gives you great options for an easy card. I really think Beautiful Peacock does just that! I've seen the peacock stamped in so many color combinations and every one have been gorgeous but I seem to be drawn to the blues and greens. I used a combination of Dapper Denim, Pool Party, and Emerald Envy for mine on this card. I recently realized that I haven't used my Square Layering Framelits so I decided to use them here. I added a few layers with Whisper White, Dapper Denim and Emerald Envy for a little something extra. The Pinewood Plank embossed diagonal layer was the added in Emerald Envy in the background as well as some Glitter Enamel Dots and some splatters to finish this one off. Really a simple card that came together pretty quickly. For my project, I made a small treat bag with a Whisper White A2 Envelope by sealing it and then slicing off a thin strip at the top to open it. I scored the bottom and both sides at 3/4" inch to make the pleats and glued the bottom triangles down with glue dots. I added a layer of the Pinewood Plank embossed Dapper Denim in the background. I decided to change up my colors on the peacock this time to Tempting Turquoise for the feathers and Emerald Envy for the body to show another option in the same color range. I hope you are ready to continue on for more Sale A Brate The Occasions Inspiration, just click the next button below and you'll be at Claudia Perry's awesome blog! Tina - beautiful projects! I like that your color scheme could go masculine or feminine. And your diagonal layer is a nice touch of different. Beautiful card and projects. Love the box with the hardwood embossing background and the peacock colors. Tina, these are so pretty! Pretty! I really like how you used the hardwood embossing folder! great projects and I love the modern look on the card with the 2 planks of wood. Great Idea! What a fun way to create a treat bag. I will have to give that one a try!